White Springs, FL--The summer of 2011 was hot and dry. River levels dropped substantially. The Fellow Travelers nevertheless made plans to canoe the upper Suwannee from State Road 6 to the Stephen Foster Culture Center in White Springs although the river level was two feet b elow recommended levels for canoeing. The total distance was twenty-six miles. Paul Tolar arrived at the Stines house just before six on September 8, 2011, so Paul, Ellen, and Charlie Stines set out by about ten after six. The first stop was at McDonald’s in Lake Park. Sam Brown arrived around eight and the trip down I-75 began. At Jasper the group turned onto State Road 6 and headed directly to the Suwannee River Bridge. The road to the river is hard to spot so Charlie and Sam drove past it and had to turn around. John and Karen Chauncey met the group and followed them down the little rough road to the river. John Williams was already at the landing. The river was very low and there was a fairly long carry from the road to the river bank. The canoes were loaded. Roy Moye spent the night with Art Shelfer at Shiloh and they eventually came. Tardiness is one of Art’s minor vices. John and Karen and Karen’s sister, Nelda Register, shuttled the drivers to the Stephen Foster at White Springs. They left about ten. John returned with the drivers around eleven. Karen and Nelda stayed in White Springs but Karen did send a delicious pear cake for the group to eat on breaks. Paul and Sam paddled the green Tripper, Roy soloed his Mohawk 14, John and Art rode in John’s Penobscot 16, and Ellen and Charlie took the red Tripper for its first Fellow Traveler adventure since receiving its much needed coat of new paint. The royalex canoes were chosen becase everyone expected the river to be rocky and fiberglass canoes are much ea sier to damage than are their royalex brethren. The journey began. The weather was the first pleasantly cool the area had experienced in a couple of months. The scenery was very pretty. 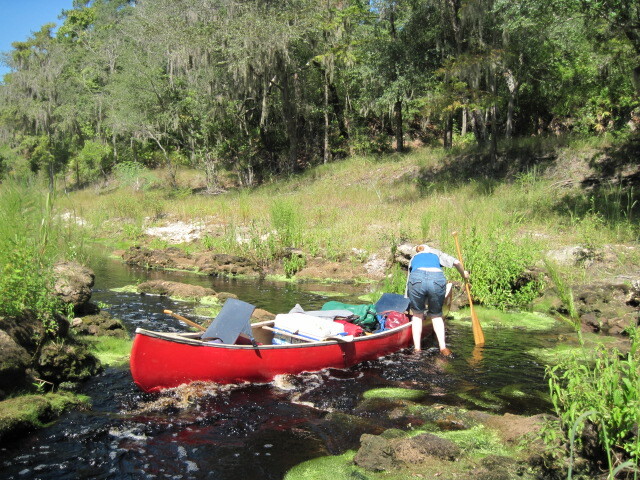 The upper Suwannee has mostly clay banks with hardwood forests but there were some small sandbars. The sky was very blue. There were lots of birds including little blue herons, anhingas, egrets, woodpeckers, and songbirds. The water was extremely low for the entire day on Thursday. Getting out of the canoes to drag over the sandy and sometimes rocky river bottom was routine. There were no places where the canoes had to be unloaded or portaged. The travelers took a lunch break after about an hour of paddling. The spot was a particularly low spot in the river. No one was in a hurry. It was a pleasant spot to spend a little time. The paddling continued. Since the GPS was not programmed for the landmarks no one knew exactly how far it was to the Cone Bridge landing. Around four a magnificent campsite appeared on the right river bank and all agreed it was time to stop. Although the spot was obviously at the end of an ATV trail the group expected it to be quiet on a Thursday night, and it was. Everyone pitched the tents and then enjoyed talking until it was time to prepare the suppers. This trip was planned without community meals so Sam and Paul ate shrimp and macaroni. Art ate a steak, John ate his usual salmon, and Charlie and Ellen prepared fried chicken in the Dutch oven. Ellen really bragged on the meal and that made her old man proud. After supper the paddlers gathered around the campfire for the usual nonsense. It was a cool, dark night and the only insects which bothered anyone were the fire ants. By ten all had gone to bed. Although there was no chance of rain the tents were all covered with the rain flies for additional warmth. There was a heavy dew so n o one was sorry. The campers were up around daylight Charlie made a pot of coffee and everyone had their individual breakfasts. It was about ten before the day’s journey commenced. Charlie and Ellen were the slow ones getting ready to leave what had been a tremendous campsite. The Cone Bridge landing was reached in less than forty-five minutes. There is no longer a bridge there but there is a concrete boat ramp. It was a good place to stop. The GPS did have Big Shoals programmed in (incorrectly) and it was supposed be about six and a half miles. It actually was a good bit farther. There was a small waterfall and a ramp not far below the landing. The area below the landing does have a few docks and ramps but the river was still mostly undeveloped. The limestone banks began to be more parent. The water was not nearly so shallow as on Thursday and in fact there was no canoe dragging the entire day. The group stopped at a landing used by canoe outfitters around two. Sam displayed the major award--a .22 rifle he found on the bank. It showed a little rust but it looked like a little tender loving care could rehabilitate it. After about a thirty minute break the flotilla headed downstream. The Big Shoals portage was not far ahead. The river was practically dry. The shoals had been serving as a dam and that explained the higher water level. Roy brought a really nice canoe cart and it made portaging to the camp much less a task. All the tents were pitched and someone built a fire. The area was littered with buzzard feathers but it was really a nice spot for camping. Again, each camper prepared the individual suppers. Ellen and Charlie used the Dutch oven to make shephe rd’s pie. The group stayed p rather late enjoying the companionship and the fire. At about one twenty the gang reached the town of White Springs and the State Road 136 bridge. The group passed the old springhouse and headed for the landing. Janice Shelfer was waiting for the arrival at the landing and it looked like she had just arrived from a fashion show. Everyone else looked a little grimy. Group pictures were taken. All the canoes were loaded and the Fellow Travelers headed home.